Punxsutawney Phil did not see his shadow, and the northern region waits for the Great Melting and the first signs of the early spring that he promised. He has been known to be wrong on more than one occasion. For me, one of the best cures for winter’s tediousness is baking all kinds of breads and rolls. The best thing about bread baking is the way the house smells when a golden brown loaf or a tray of light as a feather rolls emerges from the oven. The hypnotic aroma will make you forget winter in no time. Just the other day as I was rummaging in the pantry I saw some leftover sesame seeds, pecans from the pie I made at Thanksgiving and a package of dried cranberries left over from Christmas, so I decided to use them and make some Sicilian semolina bread and dinner rolls. Both recipes are below! 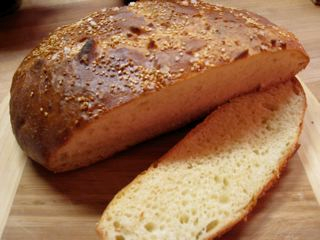 The components of Sicilian bread are semolina flour, yeast, water, salt and sesame seeds. Durum semolina (from semola, meaning grainy) is golden yellow and a finer grind of semolina that is also used to make dried pasta. The finer grind is known in Sicily as farina di semola rimacinata. 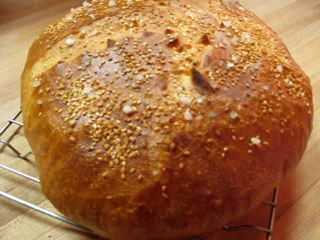 The recipe for semolina bread uses a technique of "retarding" the dough, meaning that after it rises once, it is punched down and refrigerated overnight; this gives a great flavor to the bread. If you are serious about making bread, invest in a baking stone for your oven. It will make a world of difference in how the bread bakes and the color of the crust. The recipe for the rolls uses buttermilk which makes them really moist with great flavor. They are perfect for breakfast or dinner. If I could offer just one tip to the novice bread baker, it would be to invest in an instant read thermometer to gauge the temperature of the water or other liquid used to proof yeast. Bake bread and your winter world will be warm and satisfying. Combine ½ cup of water, the yeast and ½ cup of the flour in a stand mixer. Stir to dissolve and allow to proof for 20 minutes. Add remaining water, salt and as much of the remaining flour as needed and mix on medium speed to create a ball of dough that is just slightly tacky and winds around the dough hook. Let dough rest in the mixer for 5 minutes, then mix again on medium speed for 3 or 4 minutes. Transfer the dough to a lightly oiled bowl; cover with plastic wrap and allow to rise. When risen, punch down and place in a plastic container or bag and refrigerate overnight. Remove the dough from refrigerator and transfer it to a bowl, cover and allow it to come to room temperature. Lightly flour a work surface and knead the dough for about 4 minutes, then shape into a 10 inch round and place on a parchment lined baking sheet or baking peel. Cover and allow dough to rise until doubled in size. If using a stone, place it in the oven and heat it 30 minutes prior to baking the bread. Score the top of the dough with a lame, razor or sharp knife. 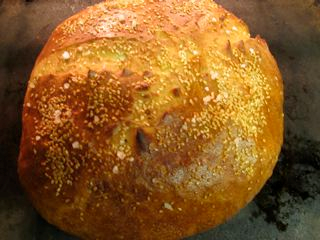 Brush the top of the bread with olive oil and sprinkle the sesame seeds evenly over the top. If using a stone, transfer the dough off the peel directly onto the stone with the parchment paper. Bake for 35-40 minutes or until the bread is nicely browned and sounds hollow when tapped. Half-way through the baking, shimmy the parchment paper away from the dough. If baking on a baking sheet, place the baking sheet in the oven and bake for 25- 30 minutes or until the bread is nicely browned and sounds hollow when tapped. Lately I have been experimenting with King Arthur Flour’s white whole wheat flour, and I like the results with its milder flavor than traditional whole wheat which can sometimes be dry and have a sharp taste to it. White whole wheat is ground from white instead of red whole wheat and contains all the good fiber and nutrition of its whole wheat cousin. I find that adding it in combination with unbleached all purpose flour gives me the texture that I am looking for in these rolls. Place milk in a large bowl or in a stand mixer. Stir in sugar and yeast. Let stand for 5 minutes.Stir in all of the all purpose flour. Mix well. Add 1 cup of the white whole wheat, salt, butter, pecans and cranberries. Mix until well blended. If the dough seems very wet, add more of the white whole wheat flour until you have a soft dough that does not stick to your hands. Transfer the dough to a work surface lightly dusted with flour and knead the dough for a about 3 to 4 minutes. 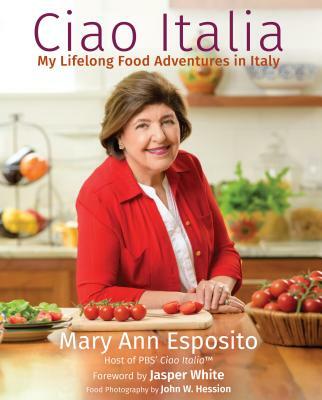 Gather up the dough and place it in a large buttered bowl. Cover tightly with plastic wrap and let the dough rise for 2 to 4 hours or until double in size. When risen, punch the dough down and divide it into 18 equal size pieces. Roll each piece under the palm of your hand into a round ball and place the balls 2-inches apart on buttered baking sheets. Cover with a towel and allow them to rise for 45 minutes. Bake the roll for 12-15 minutes or until nicely browned. Serve warm or allow to cool and freeze well wrapped for future use.